ERVING — As third-grader Jaylice Gary stood in front of her classmates at the Erving Senior Center, she read the details of the life of an Erving woman whose experiences are far different than her own. The woman lived in Erving long ago, and had a husband, children and connections to the mills that used to provide most of the employment in the region. Jaylice’s presentation one was of several made to Erving Elementary students, Erving seniors and other residents was part of a grant project the school has been coordinating since January. The students read census data from the late 1800s, found records of area residents and located where they lived on old maps of the town. They pieced together information about previous residents’ lives and pinpointed where they had lived. 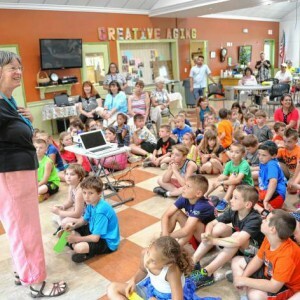 Through a program coordinated by the school’s library and a Massachusetts Cultural Council grant, the classes worked with local historian Sara Campbell over five sessions where they studied census records, toured the historical commission and town hall and learned about what life in Erving looked like in years past.